Kvalitets begyndersæt til disc golf. God til begyndere, da alle tre discs er letvægt. Discmania’s handy disc set for beginners and active players! Discmania disc set of three discs is a brilliant gift idea for disc golf hobbyist and beginners! Available in multiple weights, the light ones are great for younger players. 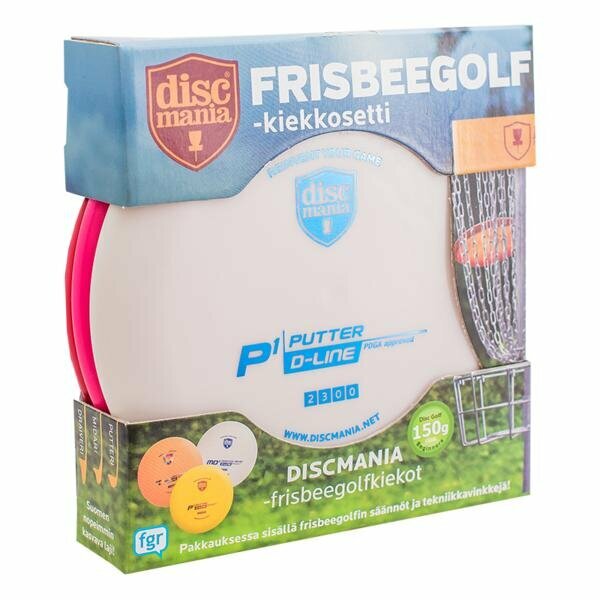 Den nye fedeste driver fra Discmania, CD3. Den bliver hurtigt din mest brugte driver. Begyndervenlig pakke med 3 golfdiscs til en en rigtig god pris. The TD - Rush, well known as one of the most versatile drivers in the game, gets reinvented in the form of TD2. Mini Markør til at markere dit leje på disc golf banen. The FD2 is a reliable speed 7 workhorse fairway driver for all skill levels. It’s not too glidey to avoid you from sailing off-target and it has a low-speed fade you can depend on.